What is Halloween and why the focus on the dead? It’s a boon to necromancers, the day when the dead are most inclined to rise up and join us in the world. Perhaps all it takes is a little pull from this side, and of course, the right date. Halloween is a part of Hallowtide, a three day observance of the Catholic church – All Hallow’s (or Saint’s) Eve, All Saint’s Day and All Soul’s Day. It was three days set apart for remembering the dead. There are those who believe Halloween originated in Samhain, an Irish celebration of the end of the harvest, and that it became Christianized by the church to hide its pagan roots. Others believe Halloween developed separately, but it’s hard to hide the influence that the Irish and other Celtic people had on the celebration. For them, there was a focus on the dead as well. 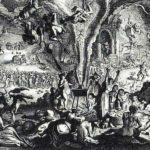 In some areas of the Celtic lands at least, Samhain, like Hallowtide was a three day holiday, and it’s believed without firm evidence that when Pope Gregory moved the date of All Saints Day from May 13 to November 1st, that it was an attempt to Christianize the pagan celebrations then going on. But it would be another four centuries before Halloween really came into its own as a holiday. It wasn’t just the Irish, but nearly all the lands occupied by the Celts which celebrated October 31, albeit under different names. Halloween is most certainly a Christian name. Except by modern reckoning, taking into consideration the change in the calendar, the proper date would now be November 7, halfway between the equinox and the solstice, or what’s known as a quarter day. 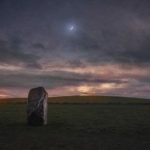 The Celts’ celebrations began at sunset, which certainly matches Halloween’s timing. But it could be that the actual date is further into November. A few centuries ago, the constellation known as the Pleiades was directly overhead at midnight on Halloween. It matches the timing of some of the earliest notations of Samhain celebrations. And it’s a sign that even the dead couldn’t miss. Not every medieval farmer was an astrologer. Farmers aren’t known for figuring time down to the hour and day. Unless there’s something visible. This is a sign which is easy to spot even now. It would have been hard to miss to someone whose survival depended on knowing the seasons and the weather. 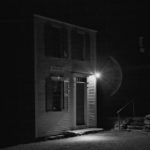 Early American architecture bore more than a passing resemblance to the medieval architecture of Europe, which made the old ghost stories and legends which came over with immigration feel more at home. 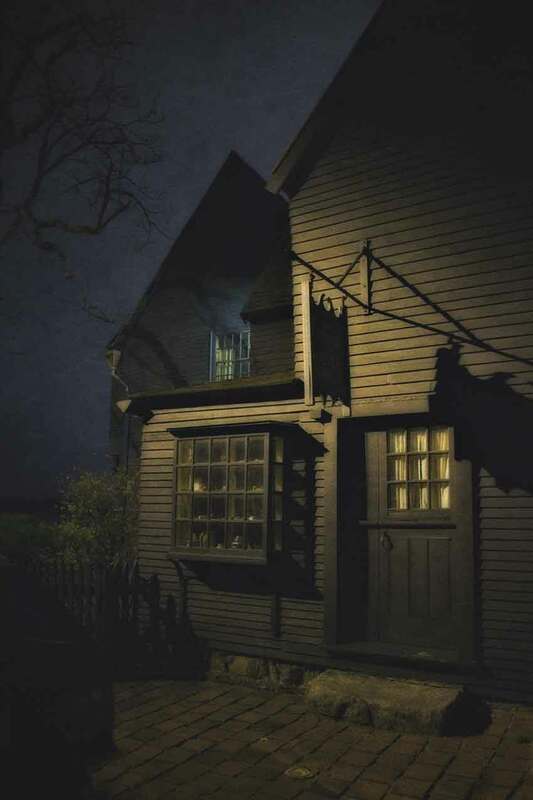 Pictured, the House of Seven Gables, Salem, Massachusetts. Now matter how you figure the date, it was believed that on this day the boundary between this world and the otherworld was thinnest, and fairies and otherworldly denizens, who were thought be the remnants of the old gods could cross over. Since their protection was essential for humans and livestock alike surviving the winter, food and drink were set out for them. In addition, it was believed the dead came home for the night, and quite often a plate would be set for their ghosts. After the meal it was time to celebrate. Hence the practice of bobbing for apples. Foretelling the future was a popular event on this night, particularly how it related to death and marriage. Originally, the apples used for bobbing had initials carved on them, and the one you pulled out bore the initials of the person you were going to marry. 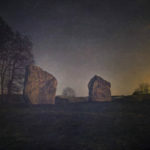 As time wore on, the fear of the dead grew stronger, and rather than welcoming them, bonfires were built to keep them away, a remnant perhaps of the old tradition, which still hung on in places, of carrying torches around the fields to represent the sun which was now dying in the sky. When you reach the fourteenth century, belief in ghosts and witches were tainted by Christianity. Instead of seeing them as natural phenomenon, they were seen as demonic or anti Christian. What was once looked at as a mystery was now seen as something to fear. Bobbing for apples is a Halloween tradition stretching back centuries. Originally the apples would have initials carved on them, and the one you selected would have point to the one you would marry. Halloween, and Samhain before it has long had a history of being the ideal time for divination practices. Guising, as well as mumming had been known since at least the 1500s, and was the practice of dressing in costumes and knocking on doors, providing a bit of entertainment in exchange for food. This was the precursor in all likelihood to trick or treating. In some areas, this incorporated dressing as the dead, or in a way which represented the dead. In Scotland and Ireland, the habit of adding tricks came into play during the seventeenth century. These people were mimicking the evil or dangerous sprits and the mischief they heaped upon the living. As they went door to door, they carried lanterns made from turnips which had carved faces to show a candle inside, what became today’s jack o’ lanterns. It was Britain which gave Halloween its name. And ironically, Britain was one of the first countries to bail on celebrating Halloween. This occurred in 1647 when Parliament banned all celebrations which bore the stamp of Catholicism. So well before the twentieth century when America took it over and commercialized it, the practice of trick or treating, telling the future and of course, celebrating and fearing the dead was in place. And had been for centuries. Halloween celebrations in one name or another had been going on long enough that the actual day it was supposed to be celebrated fell a week or more later in the calendar. It is said that Halloween came to America in the mid nineteenth century along with the Irish fleeing the potato famine. But as with all things Halloween, that’s a generalization. The problem with generalizations is that they are usually over simplifications of complicated practices. Medieval Europe, where most Halloween traditions originated was populated with an illiterate people. 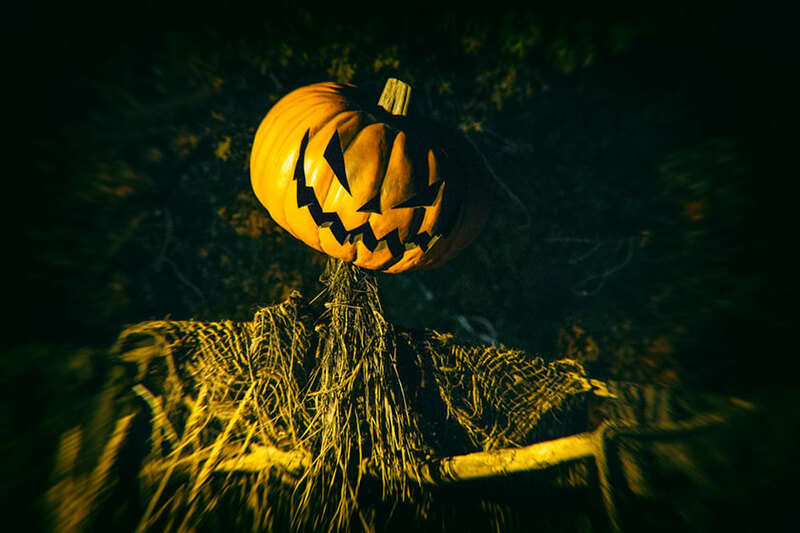 There was no single book spreading holiday traditions, and as Halloween appears to have originated in harvest celebrations, communities often developed their own celebrations. Some stuck and spread, others died away. So there is no codified version of Halloween which all others grew from. Instead Halloween, like most other celebrations and holidays developed alongside but separately according to where you lived, and when you lived there. The tie that binds them all? The connection with the dead. What is Halloween? To many it’s harvest celebrations, and the first piece of American literature to combine those traditions with what would become folk horror was the Legend of Sleepy Hollow by Washington Irving. 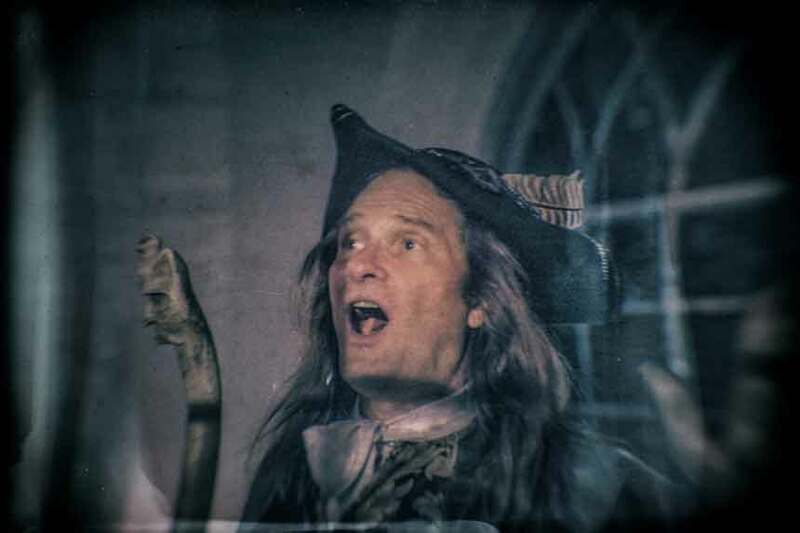 Each October, the Sleepy Hollow Storyteller, Jonathan Kruk tells the tale in the Old Dutch Church of Sleepy Hollow, where the story reaches its conclusion and where Washington Irving found his inspiration. The simplicity and perfection of the presentation hearkens back to older Halloween roots and results in each performance being a sell out. I grew up in this house. I was gone for decades and find myself back here. I sleep in my childhood bedroom. Or rather my teenage bedroom. I don’t sleep in the one I slept in when I was younger. There are ghosts in there. What is Halloween? 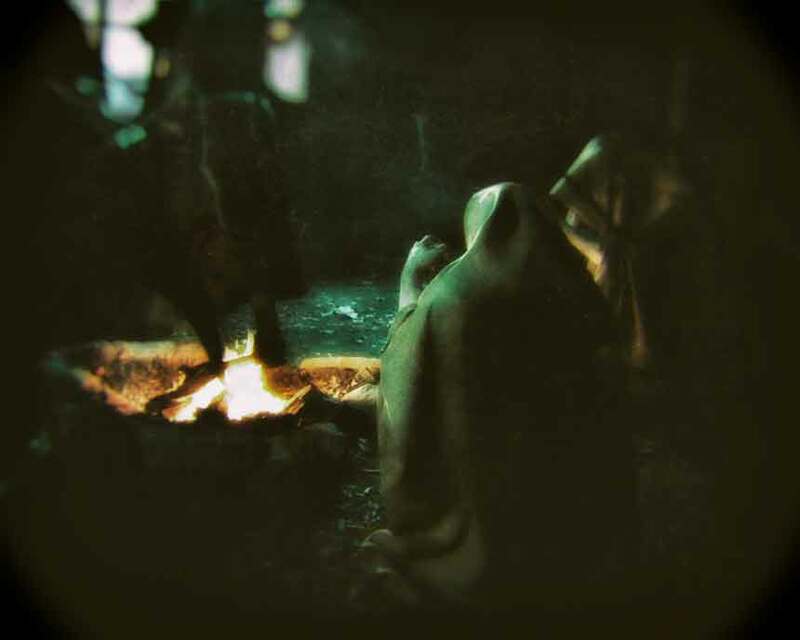 You strip away the candy and costumes, you get back to the roots and it’s the dead, crossing back over into this world, even if just for a night. I might be of the last generation to see Halloween for what it was. I was at the tail end of a superstitious generation, which was at the tail end of human history in that regard. When people were more likely to believe in something unknowable. Whether it was ghosts or gods or both. Across the road from Mr. Kruk’s performance is Horseman’s Hollow, on the grounds of Philipsburg Manor which also figures into Washington Irving’s tale of the Legend of Sleepy Hollow. 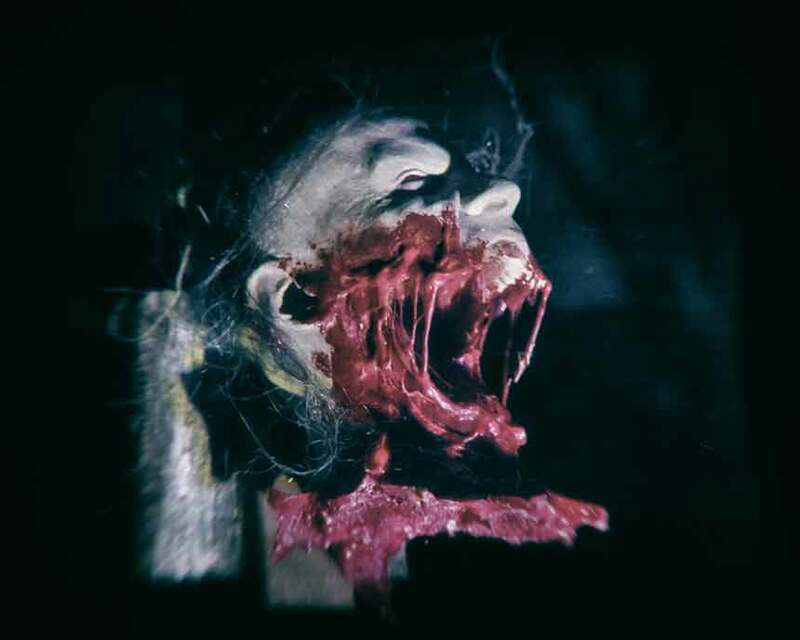 The presentation there takes on a more ghastly tone, more befitting the modern age of horror, and results in thousand of people making their way through the maze of terror each night. The two events are a perfect example of the change that’s come over Halloween in the past forty or fifty years. It was downstairs in the front parlor. The living room we called it. I was four or five years old and the family was gathered around the TV set on a Sunday night. There was a movie on, The Haunting. I had never heard of ghosts. I sat surrounded by my two older sisters, and my mom and my dad as we watched this. They thought they needed to protect me, but I didn’t understand enough to be afraid really. At least not at first. Not till I went to bed. It was a new kind of horror film, as much psychological as traditional horror. My whole family was terrified, though I thought the experience rather fun. Dad wouldn’t even go to the basement to collect the laundry from the dryer. Then again, the basement did, and still does resemble a dungeon. That night as I went up to bed I looked out the window at the top of the stairs. There on the lawn was a hooded figure, looking up at me. I didn’t know what it was. I had just learned about ghosts and you never saw ghosts in that film. I thought it was my grandpa, who I had been with that afternoon, coming back for some reason. But I never saw my grandpa dressed like that. It wasn’t the last time I saw it. The next time I saw it I knew what it was. I had learned more about ghosts in the interim. It popped up at various time, just to my right once from where I write this as a matter fact, coming up the steps as I sat bolt upright in bed listening, then for that brief instant seeing it pass the open door. Halloween was the one day of the year dedicated to that feeling, the moment of dread and horror to be in the same place with a ghost. It’s one thing to go looking for them. It’s another thing altogether to have them come looking for you. I was a teenager when the first Halloween film came out. Michael Myers wasn’t a ghost. He was deranged. It was really a crime drama up till the end, when a supernatural element was introduced. It seemed nothing more than shock value at that point. Because by the end of that film, movie goers were no longer frightened by the dead in films. They were frightened of dying a sudden and violent death. That was the seismic change in horror films. It was that fear of pain, of dying that usurped the role of ghouls in our collective fear. Vampires eventually became objects of romantic longing. The wolfman became native American. Whereas in the book version of Frankenstein the fear was of creating something that only God had the power to do, by the time of films it became the monster that was terrifying. Frankenstein films were around from the beginning of the film industry. So perhaps the seeds of the Halloween franchise was sewn in the beginning. As we became a more rational people, we lost the fear of the supernatural. Are people afraid during the ghost hunting shows of today? Those who act in them seem less afraid of ghosts, and merely afraid of being startled by them. They confront them, instead of shrinking from them. It makes me wonder if they’ve really ever seen one. Once you have your life changes. It doesn’t matter that people tell you ghosts don’t exist. You know they do. You know there is more to this world than meets the eye. Nothing is ever the same after that. What is Halloween? Costumes and trick or treating. 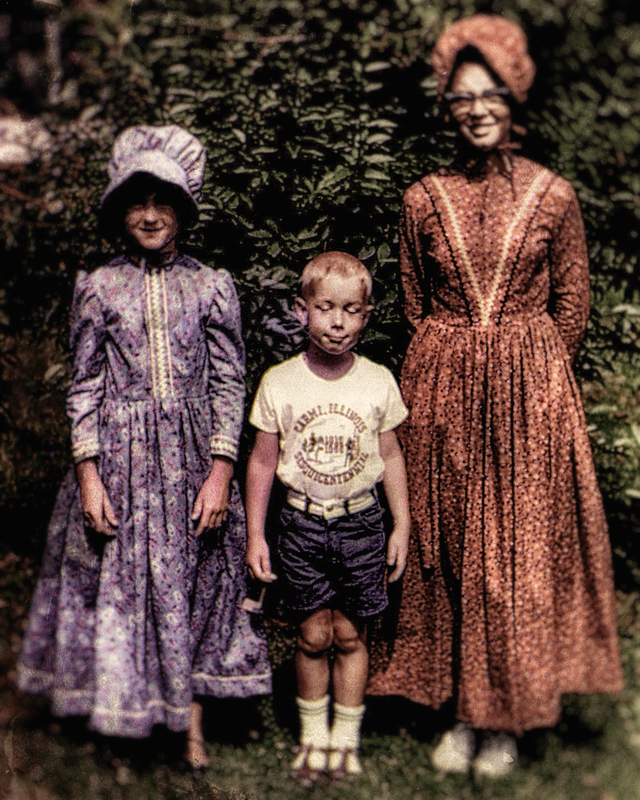 I was five in this photo, and my mother had made my sisters’ dresses for a celebration of our home town’s founding. 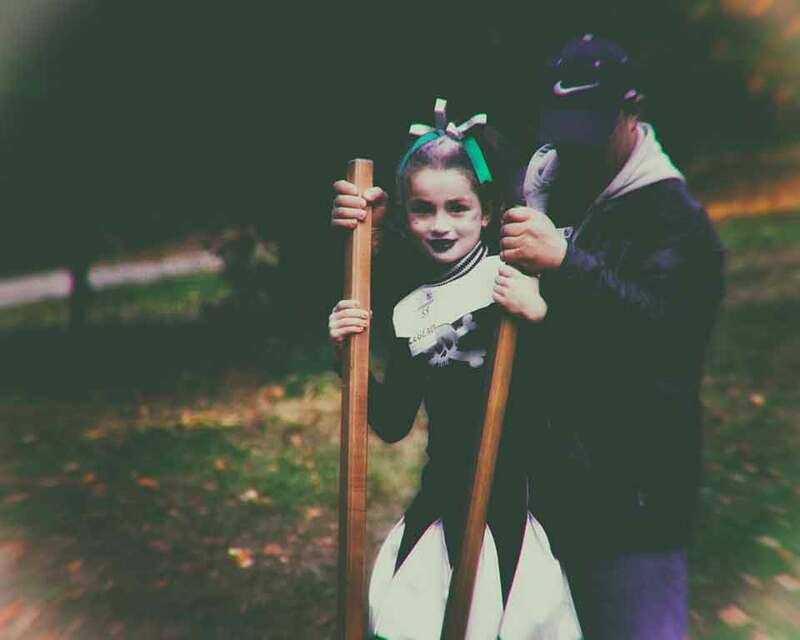 A few years later she put me in one, and sent me out into the dark to trick or treat. Behind a veil, no one could know who I was. If I spoke I gave up the ghost, so to speak, that I was in fact a boy. So I was reduced to knocking on doors and being silent, which seemed to creep out some people. Nearly as much wandering the dark streets in drag disturbed me as well. What is Halloween? On trick or treating in drag in the Bible belt during the sixties. What is Halloween? Costumes of course. And for parents in the sixties, that often meant being creative to save money. There was a celebration our town had which required my mother to make my two sisters pioneer dresses, complete with bonnets. For whatever reason, for Halloween that year my mother decided I should wear one of the dresses. She sewed a veil over my face from the bonnet so no one could see I was actually a boy. Or even know who I was. If I spoke, they’d know I wasn’t a girl. It’s Halloween and I’m less than ten years old, walking the streets of my hometown in a dress. At the time, it was alright to trick or treat alone. People ask who I am when I knock at their doors, but I’m a bit ashamed to be dressed like a girl. It wasn’t homophobia or anything like that. Gay issues had yet to arrive in my hometown in that part of the sixties, at least with kids my age. We didn’t trick or treat in groups for safety. We weren’t afraid of getting abducted or molested. Our fears were something different. It was Halloween, the night that ghosts walk the earth. What is Halloween? Trick or treating and dreading finding razor blades in apples. When I was six or seven years old something occurred to break it. There had been rumors before about poison treats, but those were urban legends. 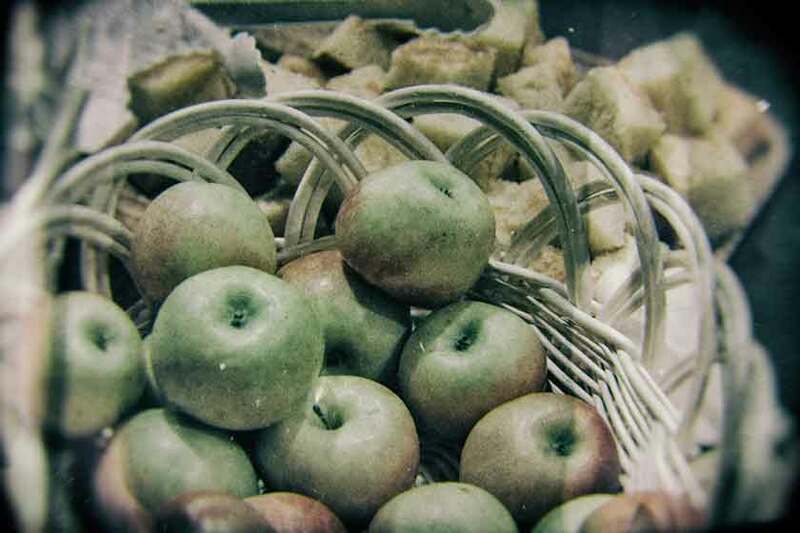 Then the horror stories changed to razor blades and needles inserted into apples and other treats. I still believe it was a hoax perpetuated by either kids who wanted more brand name candy, or the candy makers themselves. Perhaps it was an isolated case or two which started the rumors, but regardless of where the stories came from, they grew like wildfire. In reality it almost never happened and the injuries which did occur were very minor. It would be almost twenty years before it actually became a big problem. That killed trick or treating. The fear went from fear of the dead, to fear of the people whose doors you knocked on. It was only a matter of time before horror films caught up to the change. The idea that you were given treats showed that the real fear was supposed to be the people living in the house, afraid of what stood at the door. From that point on that idea was turned on its head. As a result, centuries old traditions were broken. Fears which live in the imagination were supplanted by a more material fear … of pain and death. Halloween had always relied on the imagination for its chills. From this point on, fear would take the same turn as horror films did later. We have to believe in something to fear it. As a society, we stopped fearing anything worse than death. It doesn’t mean that’s true. It just means we lost our imaginations. My kid never knew the thrill of walking darkened streets, approaching an unknown house with its light on, knocking on the door, not knowing what to expect when it opened. He never heard his footsteps on the sidewalk, crunching through the leaves in some part of town he’d never been in, when just because you couldn’t see anyone there that didn’t mean you walked alone. Halloween gave us a chance to confront our fears of the unknown, of the unknowable and conquer them. Or give in to them if that was all we could muster. What is Halloween? At Washington Irving’s house, Sunnyside, on Halloween there’s more of a traditional Autumnal celebration. The headless horseman is around of course, but he’s secondary to kid friendly storytelling, costumes and games. Without that core belief, that Halloween was the time when the dead walked the earth, Halloween has hno meaning other than the commercial. The church has seemed to give up on making their holiday a living tradition. In the rest of society, costumes aren’t usually ghost, ghouls, goblins and witches. They’re popular characters from movies and TV shows. Visual puns where once sincerity gave the holiday its meaning. We compartmentalize. The autumn harvest celebration tradition which went hand in hand with Halloween has been delegated to its own celebration, and stripped from Halloween, robbing the holiday of much of its richness. Occasionally a new film will appear this time of year, based on the supernatural. This year it’s the Netflix series of The Haunting of Hill House. 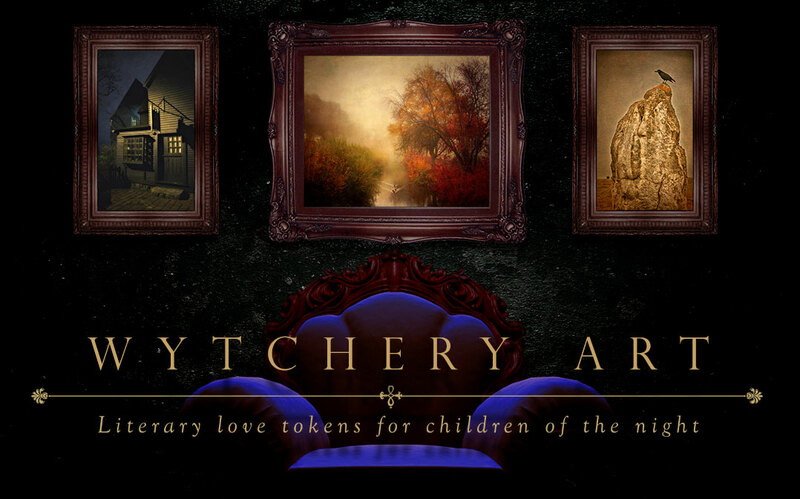 Very well done albeit shady in its pilfering of another artist’s work for its own end. But it does hearken back to the older traditions, while most of the field of horror is still what in the sixties would have been called a thriller, just with more blood, guts and brains. Zombies are big because we can watch the carnage without feeling guilty. After all, what kind of person can enjoy watching another person’s brains spilled? But since they’re zombies, not living people, it’s alright. No, it’s not. It’s the same, just with an illusionary trick to convince yourself it’s fun to watch other people tortured. It’s human nature after all. Being hung, drawn and quartered was a public event. The guillotine in the French Revolution attracted massive crowds. We love our blood sports to this day. We just have to convince ourselves we’re better, more advanced than we were in the past. Since the advent of motion pictures we’ve become a more visual society. Why read and imagine when we can watch and see? Why indeed? Because when we use our imagination we feel things stronger. The family that sat around the tv watching The Haunting in 1965 was frightened in a way that can’t be replicated today, because it’s harder for us to put ourselves in their shoes. The revised series shows the ghosts, whereas in the original, we created the ghosts in our imagination. When Frankenstein was written, the horror was what happened with Victor Frankenstein, who tried to take on the role of God and paid dearly for that. By 1931 and the film version of the story, the horror was the monster, the belief in God no longer so strong or prevalent. In the even more modern retellings, the horror is the way the monster is treated by society. Along the way the whole premise of the story, and the source of the horror has been metamorphosed. Much of gothic horror dealt with the loss of one’s soul. The fastest growing segment of religion today are those who consider themselves spiritual but not religious. People are put off by the strict guidelines sat down by organized religion. We don’t like being told we’ll suffer damnation for our sins, so we’ve dispensed of hell. When that goes, where is the horror of life after death? Ghosts are more frequently seen now as imprints, rather than spirits with consciousness. Demons are all but delegated to mythology. Possession is mental illness. We are a rational people, in love with science and superstitions are seen as quaint. We don’t need to protect ourselves from fairies, from demons or from ghosts. Science has proven to itself that they don’t exist, so if we do find ourselves afraid, we can dial back the terror by reminding ourselves of that. Halloween is now the one day we can pretend we believe, with tongue firmly in cheek. It simply doesn’t work when the other 364 days of the year we don’t believe. It’s no different from the person who is charitable on Christmas and a miser the rest of the year. The decline of classical horror coincided with the decline of Christianity. Even Jesus spoke of, and taught about dealing with ghosts and demons. As he’s become more humanized, the esoteric sides of his spirituality, and our belief in such things have declined. Simply put, it takes more to scare us now, because we’ve become a bit arrogant in our beliefs. Ghost hunting is done by technology, rather than personal intervention. Does a meter reading or EVP convince anyone of belief in life after death?Likely not. What convinced generation after generation of its existence was in large part, the imagination. We took what we were taught and let our imaginations run with it. It wasn’t the footsteps of a maniac following us in the dark on Halloween that frightened us. It was our footsteps, alone in the dark, on the one night of the year where we shared the path with those who came before us that filled us with dread, and on occasion, terror. And it was our imaginations which brought it all to life.